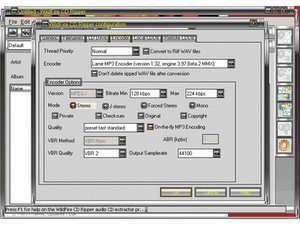 WildFire CD Ripper is freeware CD ripping software which grabs the content of audio CD tracks and saves it to your Windows PC as either a large WAV files, mp3 files, OGG files and more. The WildFire Ripper comes installed with several codecs including the Lame MP3 encoder, the OGG Vorbis encoder and the Fraunhofer MP3 encoder. Ripping CDs is extremely fast with this program and as any good CD ripper, it can automatically grab information from the online CD information database or CDDB. Album information fetched from that service will be saved as an IDv3 tag. Version 6.0.0 is a freeware program which does not have restrictions and it's free so it doesn't cost anything. For security reasons, you should also check out the WildFire CD Ripper download at LO4D.com which includes virus and malware tests. Additional screenshots of this application download may be available, too.